Not owning a car these days can sure be cost effective, especially with the high cost of gasoline. 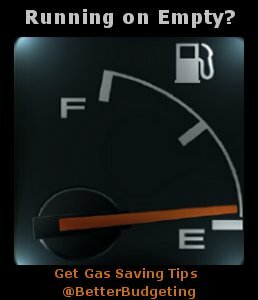 Here's a list of gas saving tips I wrote a while back when prices were just starting to climb over $2.00 per gallon here in the States. With current gas prices increasing off and on throughout the year let's review our saving tips and save some money. Here are some great gas saving tips to help you save more at the pump, including how to figure your car's average mpg (miles per gallon) and whether or not you can save money driving with A/C on or off. Doing whatever we can to cut back on our consumption of gas is not only important for saving money but it's also just good stewardship to conserve our resources. Below you'll find just about every tip I could think of to help you save money on gas, if you have an additional gas saving tip to share with our readers please contact us and we'll add it to the list. 1. Save on other areas of your household budget so you can afford the gas needed to get to and from work each week, we've got thousands of money saving tips here at BetterBudgeting.com to help you save all through the year. 2. A great website for tracking the lowest gas prices in your area is GasBuddy. And, they have a mobile app! You can also search the (U.S. or Canada) map for your state and click to see if prices are available for your city. 3. Movie tickets are already pretty high, but now we’ve also got to consider the added cost of traveling there and back. Now is an excellent time to join Netflix if you are not already a member, and and it won't cost you a single penny in postage or GAS. Tip: The "unlimited" movie membership accounts are especially great for the summer months when the kids are home from school. 5. If you run out of milk often consider switching to powdered milk, or at least keep one box on hand so you don't have to make an extra trip to the store. You'll also save money on milk as well as gas. 6. I often stretch weekly trips to the grocery store to every 10 days or more, it's a great money saver. By doing this you'll not only save money on gas, but you'll also save on groceries. 7. ALWAYS keep a running list of items you need on the fridge (groceries and non-groceries) so you don't forget anything when you do finally make your trip to the store. 8. If you're on a fixed income spend less on groceries than you normally do so you can better afford to pay for the gas you do need. Visit our grocery savings site at GrocerySavingTips to read more of my free grocery tips. 9. Carpool with a friend or neighbor whenever possible, then either share the cost of gas or take turns driving. 10. Walk or ride a bike instead of driving your car to school, work, or nearby destinations, if you're able to. 11. If you do have to drive your car to school or work, pick up groceries or other items you need on the way home instead of making a special trip later at night or on the weekends. 12. Try to get the best price on gasoline, but DON'T drive all the way across town to do it. 13. If your tank is more than half full but you see gas for a really good price go ahead and top your tank off, but, ONLY if you can't save more money by doing something else with the extra time it's going to take, like clipping a few grocery coupons. Better yet, do both. 14. Try to buy your gas during the week if you can, our local stations have always tended to raise their prices on the weekends, and especially on holiday weekends. So wait to fill up until they come back down a bit, maybe on Tuesdays or Wednesdays. 15. Make sure you remember to put your gas cap back on securely after filling up. This can be hard to do when you see how much it just cost to fill up your tank. 16. Take the highway to avoid stop-and-go traffic in the city if you can, but don't drive over 65 mph. Anything over that will eat up gas faster. 17. Don't let your engine idle for very long, if it's going to be more than a minute just turn the car off. This is one we're really having to work on. 18. When driving around town don't run the A/C unless you really need it. However, if you need to open the windows this tip only helps when you're driving at a lower speed; if you're driving at a higher speed or on the interstate the air friction from having the windows open could actually lower your mpg. Years ago when our children were very young and my husband and I both had cars without A/C we used to joke about how great it was to have FREE air conditioning, also known as 2-65! 19. No matter how frustrated you get, avoid gunning the engine when ticked off at bad drivers. It will lower your mpg. 20. Park ‘n Ride. If you live in a city that has public transportation you can park your car at the nearest stop on the bus line and then ride the bus the rest of the way to and from work, for a fraction of what it might cost to fill your tank up every week. 21. In some large cities (Seattle-WA, Portland-OR, Washington DC, Los Angeles & San Diego-CA and Chicago-IL) you can ride public transportation to work and then join a service that lets you borrow/rent a car by the hour, if you need it during the day. 22. A few of the schools in our area are considering a 4-day school week to save money on the rising costs of gas and some businesses may be thinking about as well. I know even the idea may sound a bit shocking, but who knows, maybe it could work. 23. And if you have children who ride the bus to school make sure they are ready on time in the morning so they don't miss their "free" ride. I told our children if they missed the bus again they'll have to do the dishes for an entire week-it seemed to work. 24. If your children forget their homework or lunch money at home and the school is quite a drive... well, I'll leave that one up to you. One day my youngest son forgot his weekly report which was pretty important, so I drove it up to the school and ran a few extra errands while I was out. The very next day my youngest daughter forgot her lunch money on the kitchen table, but I knew the school would let her charge it to her lunch account and we could send the extra money in the following day, so I left it on the table and talked to her about it when she got home. Packing school backpacks at night does help! 25. If your family has two or more cars you might want to consider sizing down, as long as the extra trips won't end up costing you even more than maintaining the additional cars. 26. If you’re a double-income working couple and are commuting to work in two separate cars, have the one who’s job is the furthest away drive whichever car gets better gas mileage! 27. If you’re not sure what your car’s gas mileage is… you can calculate that by writing down the odometer reading when you fill up your tank or resetting the trip meter to zero. Then, the next time you get gas, make a note of the mileage and how many gallons it takes to fill the tank back up. Take the difference in mileage (which is how many miles you drove on the trip meter), and divide it by how many gallons of gas it takes to fill up. For example, if you drove 100 miles and it takes 5 gallons of gas to fill your tank back up, you're getting 20 mpg. 28. Your gas mileage may also vary just a bit with each fill up depending on traffic and how you're driving, but you'll have a good idea of what your average is by continuing to keep track of your mileage over several weeks or months (a small notebook would be handy). Once you have at least several weeks of figures to use, add the mpg averages together and divide them by how many there are. For example, if you've got averages of 20, 21, 19, 22, and 25, your total would be 107 and you would divide that figure by 5, bringing your average to 21.4 mpg. 29. If your car gets less than 20 mpg you might consider trading it in for one that's more efficient. SUVs may be great cars, but I'm still very glad we don't have one! 30. Consider getting a Hybrid vehicle. Our local news featured a gentleman who has a Honda Hybrid, he was laughing all the way home (as he was in the interview) I'm sure... his electric car gets 77 MPG on the highway! Yes, you read that correctly, 77! He also said that they are not as difficult to recharge as people think, it automatically recharges every time you step on the brakes. 31. Keep your car in good working condition, this includes oil changes (every 3,000 miles), air filters and checking the engine regularly. Getting a tune up might also help, especially for older models. Check your owner's manual for recommended service dates. 32. Make sure your tires are inflated properly, and rotate your tires every 6 months or as often as recommended by your service company. 33. When driving on the highway use your cruise control if you have it. This will also help you avoid those nasty traffic tickets that would eat up all of your hard earned gas savings! 34. If you’re still using premium gas instead of regular unleaded check your owner’s manual to make sure this is necessary. Most vehicles are made to operate just fine on regular unleaded! 35. Shop online whenever you can to avoid extra trips all together, we have a special list set up for clearance sales and special offers (including free shipping at many online stores) in our Shop & Save department. Don't buy anything unless you really need it though, every dollar you save can help pay for the rising costs of gas, food and housing. 37. One thing I do not do anymore is to spend a lot of time looking for the lowest price on gas each week! I generally know which gas stations have the best prices and I watch their price boards as I drive by during the week--which costs no money and NO TIME! When my tank starts getting low I make sure to stop and fill up at a good time; at the station that I know has the best price! I have a very busy schedule and have found this works best for me, I seem to get the lowest price on gas about 99.9% of the time using this method. So I think whatever method works best for you is fine; whether you search for the lowest prices online before you leave the house or just make yourself aware of prices in your area throughout the week. Do you have a gas saving tip you'd like to share with us? We'd love to hear from you! 38. "Carrying extra weight in your vehicle decreases fuel efficiency. I drive a minivan but usually don't need all of the seats. We took out one of the middle row captain's chairs. Having put it back in there once, I can assure you that it is quite heavy. It's that much less weight that needs to be moved down the highway." - Shona R.
39-1. "My gas tip is to only fill your tank half full because having less weight from all that gas in your car will help increase your gas mileage." - Conrad B. 39-2. "If your using your car or vehicle for smaller trips, and are near quite a few gas stations (making sure you don't run out of gas! ), fill the tank only to about a quarter to a half a tank full... less weight for the car to carry and more mpg." Jason W.
39-3. "To save even more money on gas you can wait to fill your car up (if you can get back to the cheaper station without going out of your way to fill up when you need to). Much like any heavy items in your car, fuel itself adds weight to the vehicle. I recently was forced to overhaul my driving, I have slowed down on the highway, use cruise control whenever possible, stop for the cheapest gas, stopped making those jerky "gun it" starts, and I wait to fill up till I absolutely need to and of course regular maintenance. I used to get 300 miles to the tank - now I get about 380!" - Ericka O. 39-4. "The correct answer would be to try to keep your gas tank filled to over half (i.e. add gas once it gets to half empty). You get better mileage on the gas if it is over half full. I've been told that my entire life from every mechanic with whom I've had contact, as well as from my parents and grandparents. Additionally, keep the car in good tune. If everything is working properly, it drives more efficiently. I've also been told to keep track of your miles per gallon. It not only tells you how far you can go on a tank of gas, but it will give you early warning signs of car trouble. If you regularly get 28 miles per gallon and it begins to drop off consistently (from 28 to 24 or less, and it's not due to bad gas and traffic conditions), it's time to check the car for potential maintenance issues." - Donna W.
40. "A lot of gas stations in our area are starting to offer a reduced price per gallon if you pay in cash, versus paying with a credit card. Most of the time it's a difference of about 10-20 cents per gallon! If you fill up a couple of times a week, that could come out to enough extra cash to pay for one extra tank of gas. So, next time you're at the bank, take out some extra cash for the "gas fund." But, don't make a special trip there, or that might eat up some of your savings!" - Tina B. 41. "Look for gas stations who offer gas rebates if you use their credit card. A local NJ convenience store chain offers 4% back if you use their card. Other purchases are 1% back. Charge what you can, always setting aside the cash to pay the bill every month so you don't lose your savings in interest and fees. My wife and I recently purchased a dining room set. We used our Visa card to make the down payment, having the cash in the bank to pay the bill. We received $150.00 in gift cards that we used at the pump. That's a lot of free gas." - Chris K.
43. "Our family enjoys garage sales, but with the price of gas we only go to neighborhood sales. When we get to the neighborhood, we park and walk and pull a wagon behind us for our 'treasures.' We get some exercise too!" - Lisa R.
45. "Let your car coast to a stop light instead of keeping your foot on the gas pedal; only to apply the brakes just before stopping." - Margaret Y. 47. "Before you go grocery shopping or run errands check with your local neighbors/friends/relatives and do some of their shopping at the same place you are... in turn they pay you or they let you use their car in return for your time and effort." Marla H.
48. "Drive UNDER the speed limit... let all the other motorists waste their gas, as they pass you up (it is there choice, not yours). If it is 55, I usually go 50, while everyone else drives 60 to 65! It also helps you to learn patience and to SLOW down the pace in other areas of your lives." Marla H.
49. "Learn to brake less while driving. (This increases mpg and also prolongs the life of the brakes). You can do this especially well on familiar roads you often drive. Anticipate bends and turns in the road. Letting up on the gas often eliminates the need for breaking. Coast to (but not through) stop signs. Pull out from stops slowly rather than gunning to full speed. Unless, of course, you are merging into traffic." - Gary G.
50. "I have never had a car. I've lived in Boston, Providence, New Orleans, and Atlanta since 1971 and used public transportation. I have found buying the monthly card is the best thing to do. Wearing a smile and carrying a paperback to read I have managed to enjoy myself and have made amazing friends – true very close friends – from fellow bus riders. I wear perma press clothes, send them thru the cold wash every night low level. Because, you can sweat a great deal. "Aren't you glad you use Dial?" I wear a good deodorant. Buses and trains are close quarters. Always carry a pocket sized umbrella. Wear sensible shoes. Carry dry socks. Make notes of what stores museums and libraries you pass and go to them along the way. I can bring home veggies, fruit and nuts one night. Bread and milk the next after work. Coffee beans on Saturday, while visiting the museum. Also note the second hand stores and farmer's markets and hardware stores. For thirty years I used Laundromats, kept a hefty roll of quarters and a wire pull cart. Made a Saturday morning of it, read the paper and drank coffee and talked while I washed. Did a lot of hand washing in between. It isn't the greatest life, but it is good if you make use of your time. One of my friends who still washes at the Laundromat is a Chinese brush artist. I need to get over to see her work one of these days and take her some gourds I grew for her to do a painting. - Susan H.
51. "When filling up your gas tank don't 'top it off' after the pump clicks that your tank is full. Apparently that tiny bit of gas you add just dissipates. I don't know the scientific facts on that one I just know that is a tip I have heard.' - Shastina H.
52. "I stumbled upon your Web site while looking for info on how to budget my personal finances. (Well, you came to the right place for that, Aaron! :o) I found a lot of helpful info. I wanted to point out something regarding tip #34, which suggests to switch from premium gas to regular gas to save money. My whole life I was told just as you have suggest, if your engine wasn't designed for premium, then it doesn't help you out by using it, and it's a wasted expense. However, about a year ago, when purchasing a used car from a car collector (who also happened to be a retired auto factory worker), he told me that ANY engine will get better mileage from premium gas, and it will help keep the engine cleaner and in better shape. He challenged me to test it out, so I did. The results were clear; I got 5-7% better gas mileage with premium gas vs. regular gas. With gas near $4/gal, this means if premium is within 20-30 cents of regular, then it pays for itself. Plus, you have the added benefit of it being better for your engine which will (hopefully) mean less auto maintenance repair expenses. This may vary regionally, but where I am at, in Minnesota, premium is generally only 15-20 cents more than regular. I've used nothing but premium since testing that out. There is a science to why you get better mileage with premium, but I will save those details for now. Just food for thought. I challenge you to compare these fuels yourself." Aaron M.
Copyright © 2005, 2006, 2007, 2008, 2011, 2012 by Michelle Jones. All rights reserved.